This is Himeko's priestess form. the traditional Miko robes. 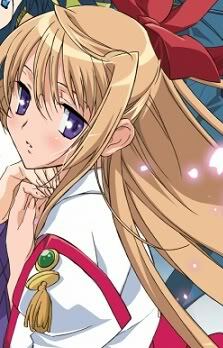 Bio: Himeko is initially a shy and timid girl, uncertain of her own worth and abilities. This is mainly because after the death of her birth parents, she was initially adopted by abusive relatives before being moved to other relatives. At school, Himeko seems to have only a few friends, Souma and Chikane. Personality: The Solar Priestess, Himeko is a very shy, innocent 18-year old. Dedicated. Despite her timidity, Himeko gradually starts to display great determination and courage in the face of evil. Likes: Reading, parks, taking pictures. Dislikes: Bad things that hurt others. Being away from Chikane. Hobbies: Himeko is an average Photographer.